Our garments are loosely based on historic styles and to achieve this look we cut more generously than is the norm these days. Shirts have approximately 8” of ease over and above the stated body size. 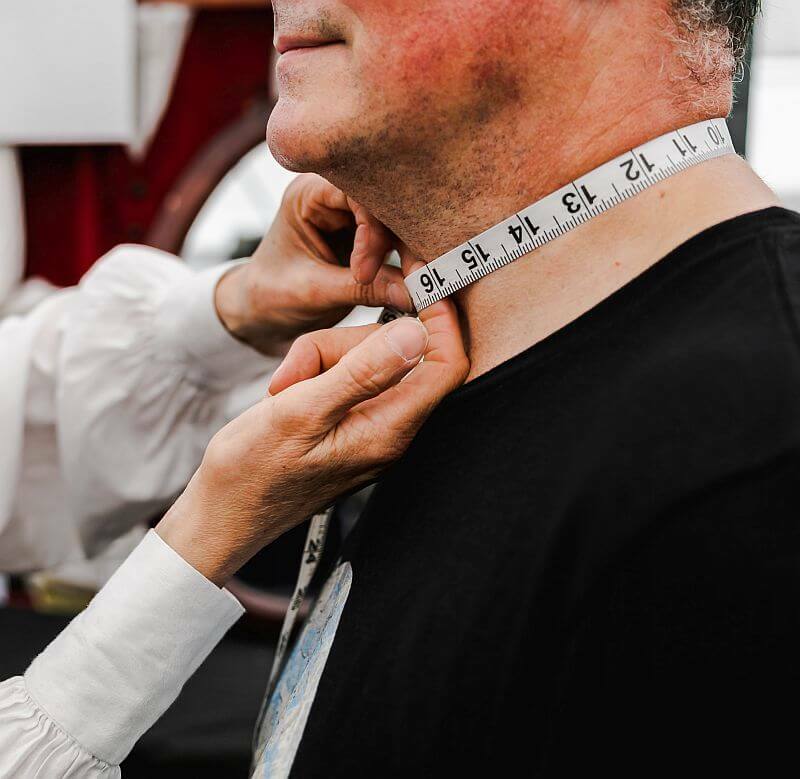 We advise you take measurements, look at the appropriate size chart, then re-measure. Please ring and discuss if you need help advice to decide which size to buy. 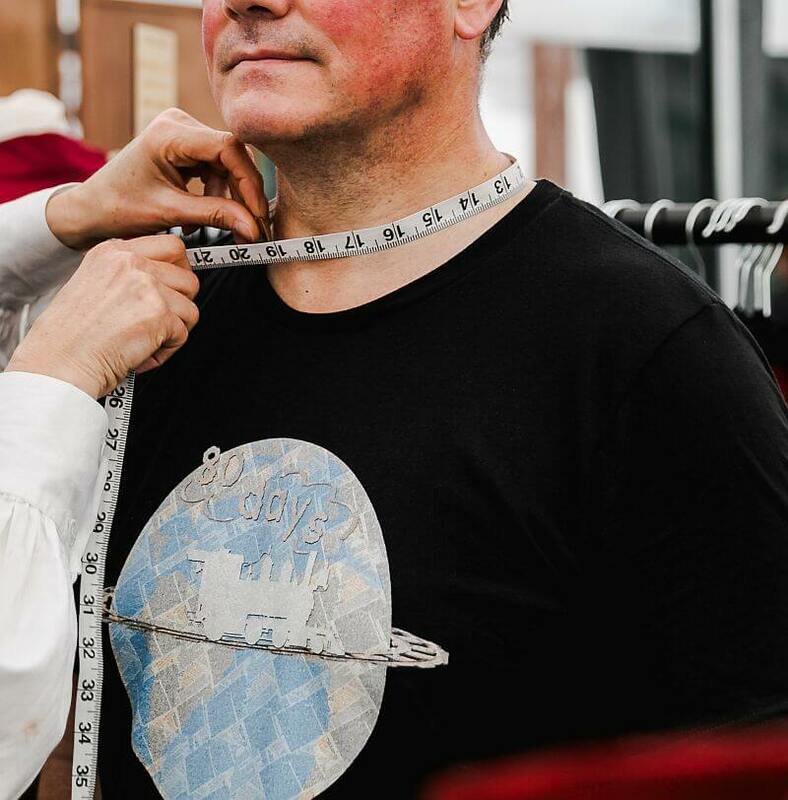 Put tape measure round neck at the smallest point – where the collar will fasten. Place finger inside the tape, letting the tape out until it is comfortable. This measurement is from spine to wrist bone – a measure of the skeleton from centre back, across shoulder, round bent arm and to wrist bone. Ask the subject to raise his fist towards his face, place first end of tape measure on the backbone and hold the tape against the body, right round the bent elbow to the wrist. A sleeve will ride up to the wrist bone when you hold your arm in this position, then drop down into the correct position when you release the arm. Place tape around the body at chest height, arms down, ask the subject to “breath normally” and take your measurement. 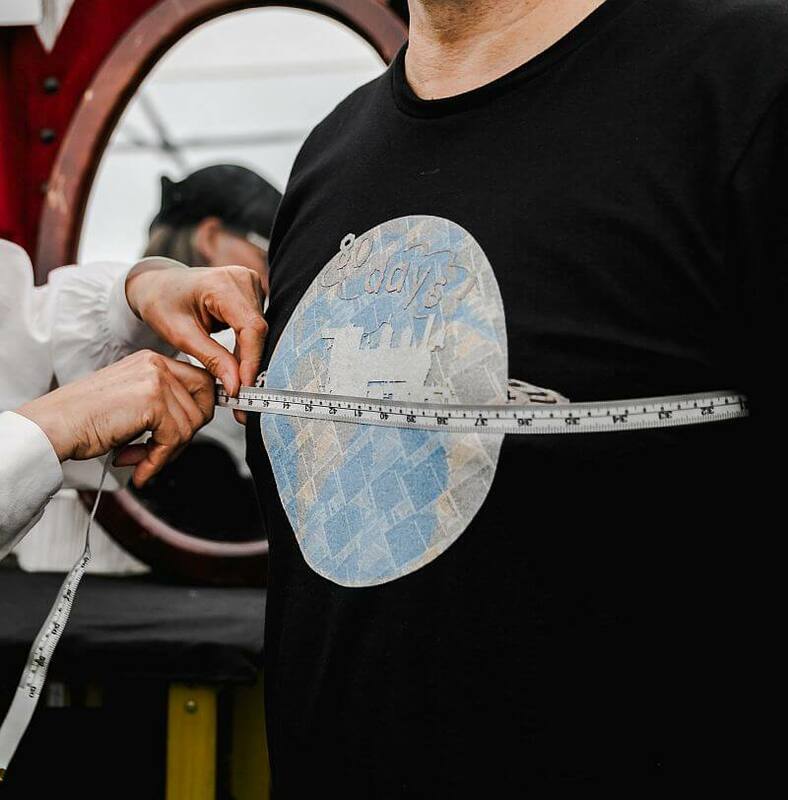 For a shirt we only need the chest measurement. A large waistline is not a constraint for a shirt, so men with big tummies can look better in a smaller size. For big tummies – take a measurement at the largest part of the torso and use this as your chest measurement. Only men who are tall with wide shoulders may need a size larger. 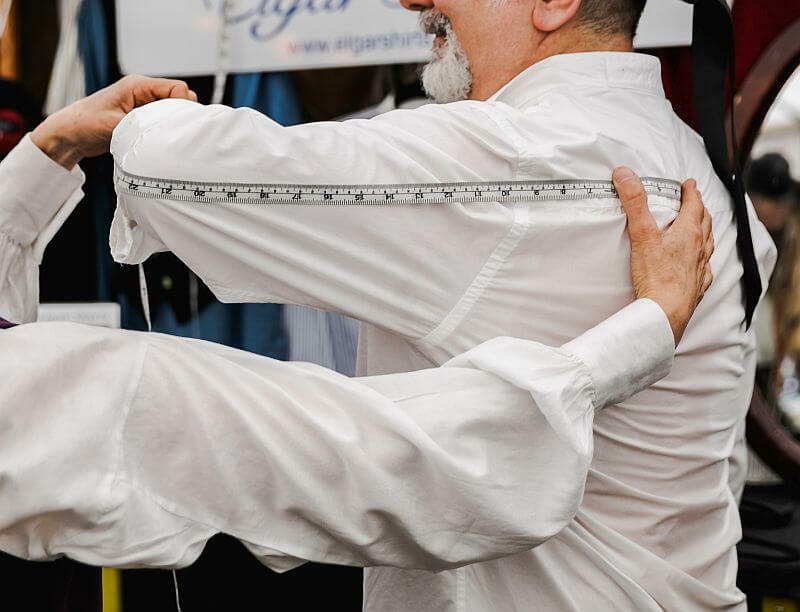 If our standard size is not right, or you know you are a non-standard size please get in touch – we can cut and make a shirt to fit you. Waistcoats have approximately 3” of ease over and above the body size. This allows for essential movement and makes for a comfortable and flattering fit. All except the corduroy waistcoats have adjusters on the back, so waistline will not be an issue. If you are very tall or short you may look better in a waistcoat made to suit your proportions. Place tape around the body at chest height, arms down, ask the subject to “breath normally” and take your measurement. 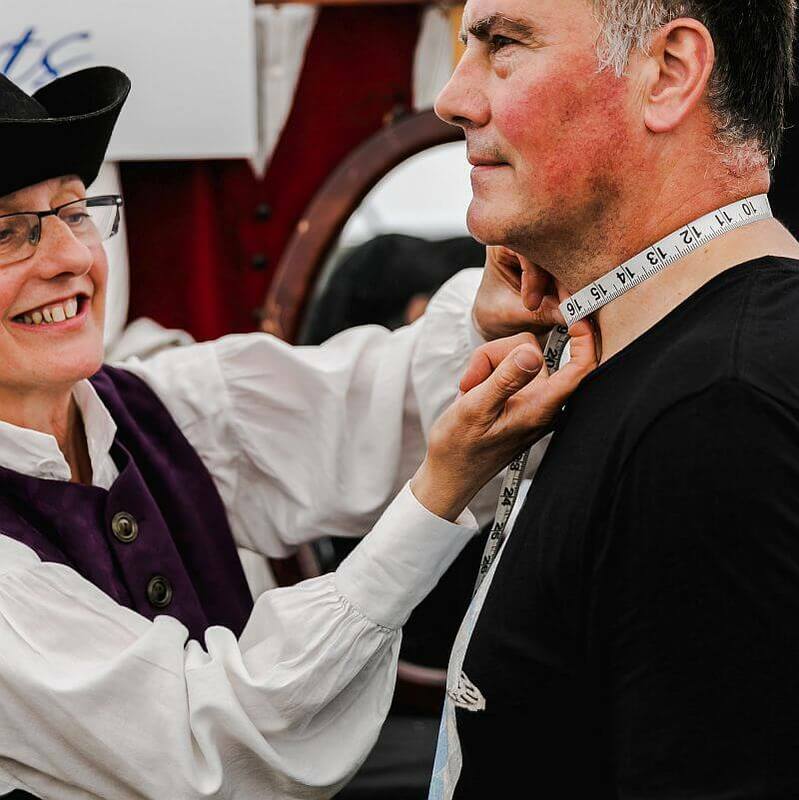 We sell waistcoats by chest measurement. If the tummy is bigger than the chest, place tape around the body at the navel level and measure at the biggest point. For a good fit either buy up one size or we can make you a waistcoat with extra cloth in the tummy area, and extra on front length. 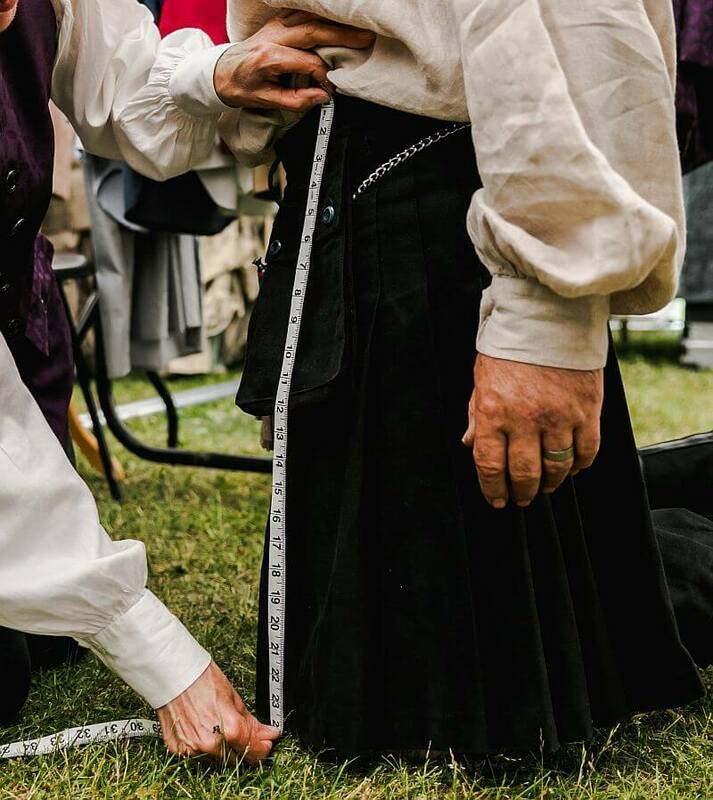 Kilt waist – place tape around the body at the navel level and measure at the biggest point. Pull the tape tighter, asking the subject if it is still comfortable. A kilt normally sits at the natural waist, at navel level, a few inches above the point where your trousers sit. Kilt length – ask the subject to kneel down and measure from navel to ground level. Our standard kilt length is 24”. 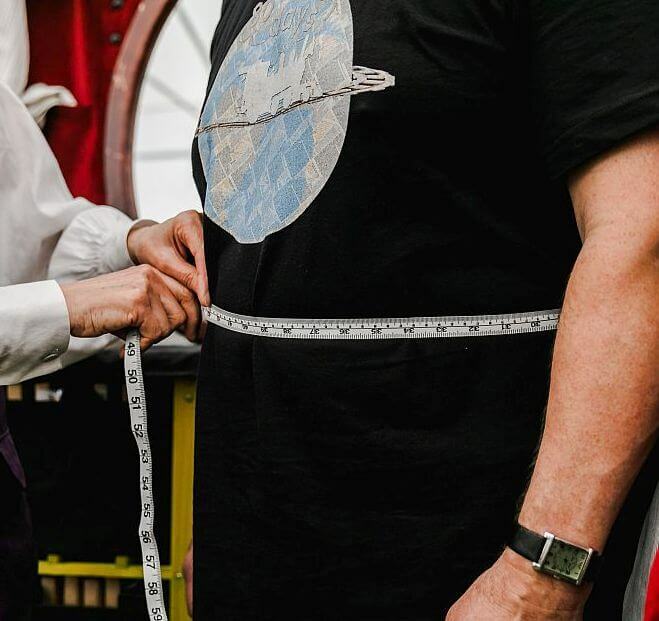 However if your legs are very long or short, or the size of your tummy means that you will not wear the kilt at navel level, then please contact us to discuss your requirements.